Before FishWare was created several existing 'solutions' were evaluated. We found them limiting, not very informative and not intuitive. Aspire decided to approach the issue by thinking 'out of the box'. This meant that instead of utilizing the normal database forms and tools we decided to create out own interface based on real world intuitive principals. 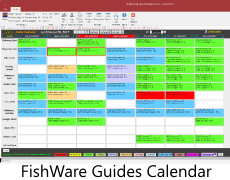 It was decided that Weekly Calendars showing customer names and activities was the best way to display data to the FishWare User. 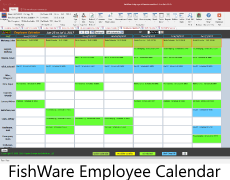 In the early days of FishWare, only a few calendars were present (Weekly Lodging, Meals, Housekeeping, Guided Fishing) , but as time went on we realized the need to add additional calendars. 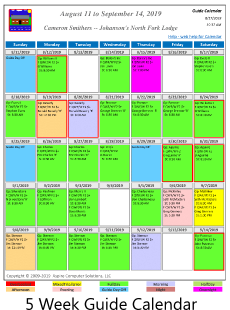 The Monthly Lodging Calendar was added followed by the Staff Calendar, Employee Calendar and Venue Calendar. 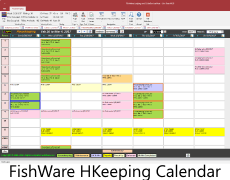 Today FishWare features 10 Calendars, 8 for internal processes displayed in the FishWare user interface and an additional 5 Week Guide Calendar and 6 Week Staff Calendar. Calendars use a fundamentally different technology as respect to underlying data when compared with conventional 'Bound' forms. 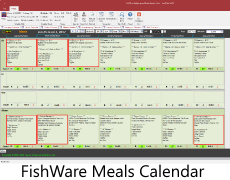 Calendars are not cnnected directly to data, but instead are populated as the form is displayed. This makes it easier to change records in forms that are connected directly to data. 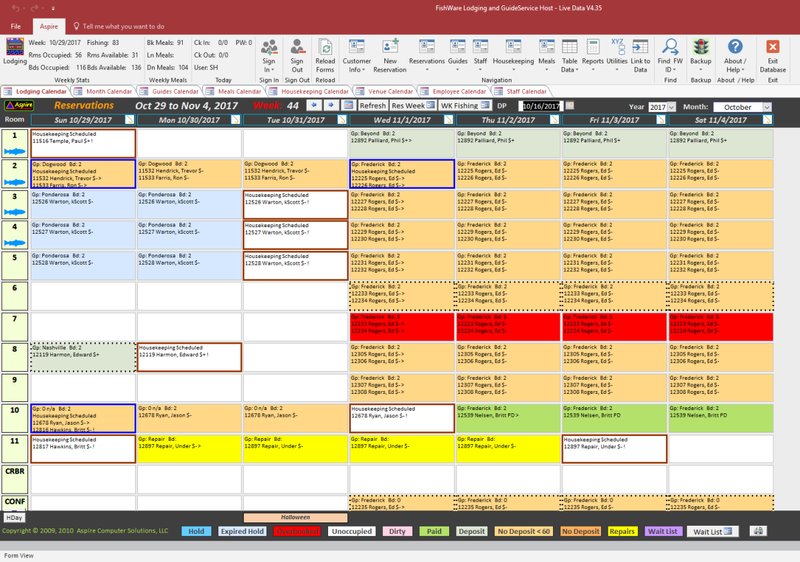 Color coding of Calendar data intuitively makes it easy to identify specific types of data or conditions. 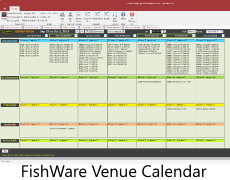 For example, on the Lodging Calendar, background colors are used to manage Deposit Status, Holds, Overbooking, Dirty Cabin, Wait List and Room Under Repair. 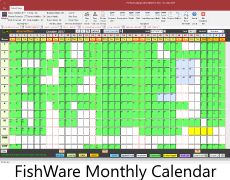 Borders on Cells add another way to identify calendar specific unique conditions. Another useful calendar utility was added several years ago by showing Holidays and Optional Special Events in the footer section of the Calendar. 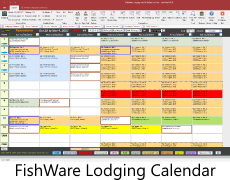 FishWare includes traditional Christian and Jewish Holidays in this data set, National Holidays (US & Canada) and provides the ability for the user to schedule their own Holidays/Events. There are 3 main ways of making a new Reservation in CoffeeRoaster. In recent years, the ability to create a customer and then Double Click on a Calendar (Lodging, Venue, Meal) has been popular. For a Quick Video on how easy it is to create a new reservation in FishWare go to the following link, download the video file (*.wmv format), and then view it in a Windows computer. FishWare is designed to complement rather than replace a professional accounting package. The role of the accounting package or packages is to invoice customers for lodging and fly shop purchases, manage payroll and complete credit card processing. 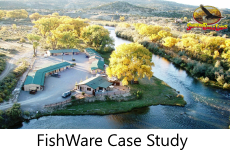 FishWare manages Lodging, Guide Trips, Meals, Housekeeping, Fishing/Activity Venues, Employee scheduling and Staff Management. 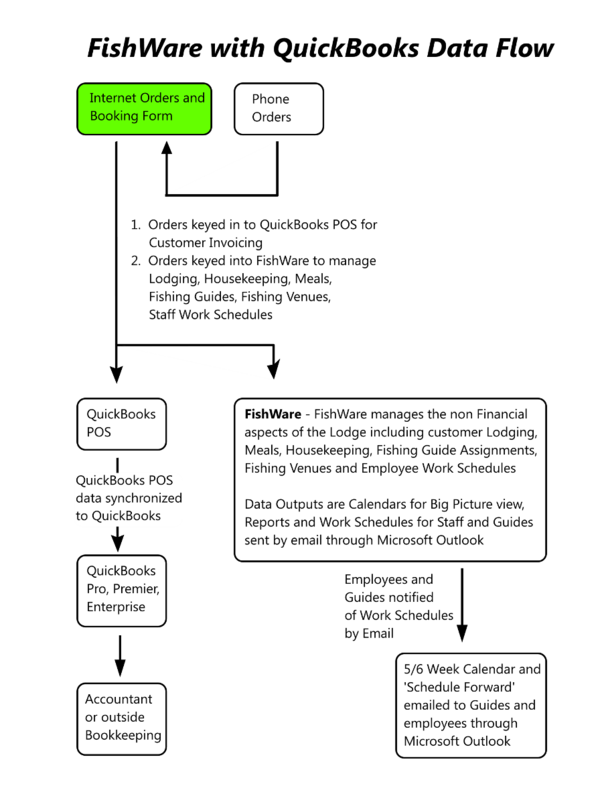 The image below shows a recommended process for managing Accounting and Fishing Lodge services with QuickBooks, QuickBooks POS and FishWare. 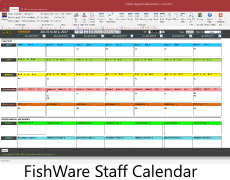 In addidtion to the Weekly and Monthly Calendars, FishWare produces a 5 or 6 Week calendar that can be emailed to Guides or Staff.